Sara finds Chanukah celebrations boring. When her Tante Miriam arrives and gives her a Golden Dreydl, everything changes. The dreydl, an enchanted princess in disguise, takes Sara on a journey to a magical world. When the princess is taken by the Demon King, who possesses the power of the Tree of Life, it is Sara who must use her wit to save the princess and return her to her parents — King Solomon and the Queen of Sheba. A delightful holiday tale that weaves together threads of Jewish folklore and tradition with fantasy and humor. 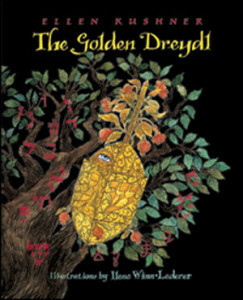 “The Golden Dreydl is a story for any Jewish child whose holiday candles may have felt dimmed by the super-charged wattage emitted at Christmas . . . .The story of Sara’s fantasy experience is engaging . . .The reader is swept right along . . . a willing participant in the journey through time. Kushner has a gift for dialogue, which is difficult to accomplish when writing for teenagers. . . . You know these kids. Maybe they are your kids.